As we continue to inch our way toward Opening Day on April 6, we sit 38 days away today on February 27. That’s the bad news. The good news today is that all the players have reported (with one not-quite-official free agent signing as the exception), the first full squad workout has been completed by now, and we’re less than a week away from the Cactus League opener. As everyone gets better and better each day, shaking the rust off of their throwing shoulders and batting eyes, the anticipation is building toward actual, honest-to-God, on-the-field, competitive baseball where they actually keep score. 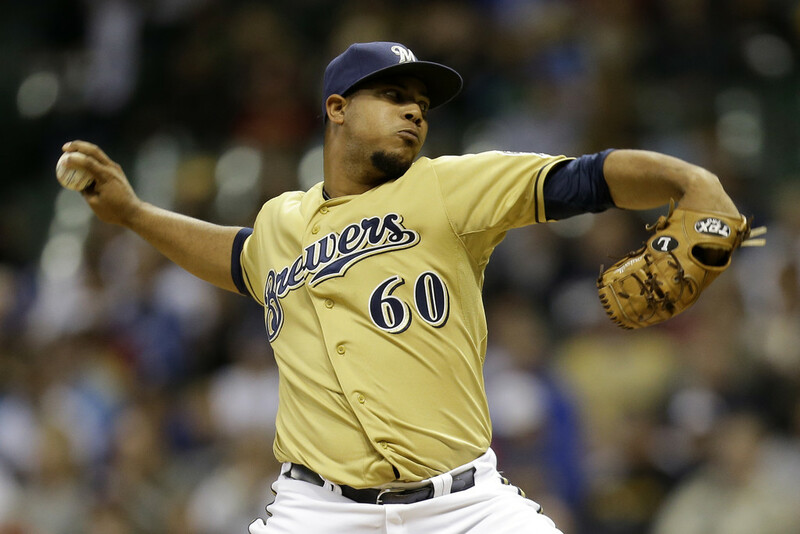 The workhorse right-hander from the Dominican Republic with the heavy fastball, Wily Peralta continued 2014 where he left off 2013. That is to say that he took another step forward in his development. Peralta had a number of problems as a younger pitcher, both in terms of starting seasons slowly from a production standpoint, as well as letting the mental side of the game overwhelm him at times. 2014 was the first season where we saw almost all of that gone from Peralta. He was much more even in his demeanor and when situations arose where he’d think or emote himself out of his game, he was able to calm himself down quickly and get back to it. Probably the only issue I saw in this realm was in August. That’s when the offense was scuffling and both Kyle Lohse and Matt Garza were on the shelf. It felt to me like Peralta pressed that month. His team needed him and he put too much pressure on himself and suffered for it. Once the rotation got back to full strength, he settled back down and finished the season strong. Now for statistical backing. Let’s throw Peralta’s month-by-month splits from Baseball-Reference.com. You’ll see April and May were strong, August (and July) were rough, and September was very good. Ironically, Peralta won just one game in May, won all of his starts in June despite a 4.22 ERA and went 3-1 in five July starts. But as you can clearly see, Peralta got off to a nice start and his finish was even stronger. Speaking of strong, the 6’1″, 245 pounder certainly has a big fastball that he runs into the high 90s, mixed with a power slider. He generates a ton of ground balls when he’s going right (53.6% in 2014 and a career mark of 52.5%) and mixes in plenty of strikeouts. Peralta can be prone to some BAbip concerns as his worst statistical months carried his highest BAbip figures. Bottom line for Peralta is how big of a next step he takes. Some decriers will say he’s even due for regression, but conventional thought is that Peralta maintains or improves on most of his overall stats. He may not win 17 games in 2015, but smart fans know that win total isn’t the best way to tell how well a pitcher performs. There’s room for improvement in terms of consistency and within each start. 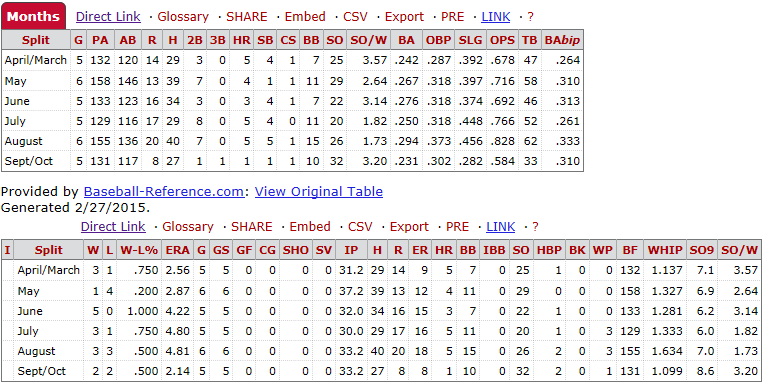 There’s a chance that the nearly 26-year-old hurler will assume the mantle of best pitcher on the staff this year. He’s capable, but he needs to continue along the same path of improvement he’s been on. He nearly pitched 200 innings, an in-season benchmark of a top-of-the-rotation starter, and with a bit more in the way of positive results, he’ll be right where he and his teammates need him to be. I’m as interested in watching the continued development of Peralta as I am nearly anything else about this year’s Brewers. I think you should be too.